Do you love listening to music, checking your location, or shooting videos while riding your bike? Or would you like to answer or make calls hands-free when cycling? Well, with a good bike phone mount, you’ll be able to do all these. 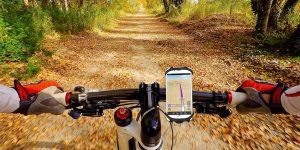 The simple device is installed on the handlebars and offers a firm support to your phone. The good design doesn’t restrict the functionality and ensures you have easy access while the hands-free design allows you to focus on the road ahead and not so much on the phone and this minimizes accidents. Over the years, manufacturers have released all kinds of phone mounts. They come in different designs, colors, materials, mounting techniques and more. This makes picking an item from the many types not only a challenge but requires time as well. 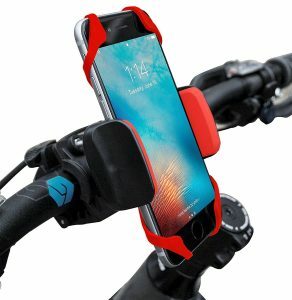 In this top 10 best bike phone mounts in 2019 review, we will briefly look at the top items on the market. This gray-colored phone mount is perfect for most bikes on the market. The plastic-made unit comes in a universal design and is compatible with most phones on the market. The 360-degree rotatable design allows you to select the best viewing angle or position while the cradle clamp makes fitting simple and straightforward. The unit features a silicone band for added safety whereas the non-slip memory foam absorbs shocks and vibration. And since it also features rubber grip cables, your phone will stay firm even on rough terrains. It’s a popular choice because of the simple design, easy mounting, firm support, easy adjustability and compatibility with many phones. Coming in red color, the Widras bike phone mount is popular with newbies and also seasoned riders. It’s made from quality ABS plastic and silicone and comes with an easy-to-mount design. The stylish accessory features ultra-strong strap systems for improved support while the rubber material and clip help in absorbing shock, impact, and vibration. Courtesy of the universal design, this mount works with most phones on the market and it takes less than 5 seconds to set it up. In addition to quality material, good design, and easy mounting, this gadget is loved for its simplicity, versatility, and competitive price. 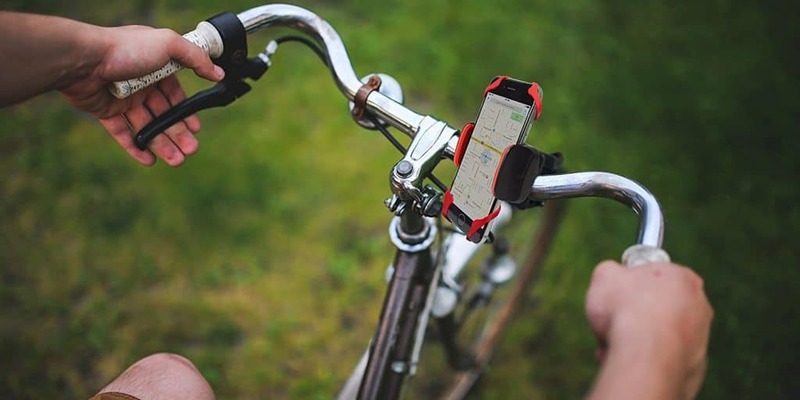 With this phone mount, riding your bike or motorcycle will be more convenient. The universally designed device comes with a cradle holder that easily fits on the handlebars of most motorcycles and bikes. It’s designed for diameters ranging from 0.6 to 1.4 inches and doesn’t require any tools for assembly. The 360-degree rotation allows for easy change of position or direction while the adjustable grip enhances the convenience. The silicone belt grips together with the rubberized clips offer a firm support and absorb shock and vibration. It’s a good piece because it’s easy to install, very adjustable, offer a firm support, and suits many phones. 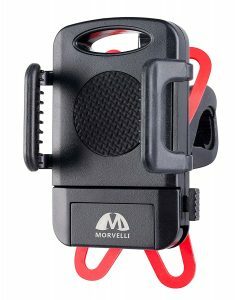 Operating your iPhone, Samsung, or any other phone while riding your bike is easy when using the Morvelli phone bike. It’s constructed from quality plastic that can tolerate the elements and regular use as well. It can support devices with a width of 1.97 up to 3.94 inches. The unit comes with a simple mechanism for easy installing and can rotate 360 degrees, and this enables you to choose the best viewing angle. Removing the phone from the mount is very simple and easy thanks to the “One-Click” release mechanism. Consumers love this mount because it’s easy to install, supports a wide array of phones, it’s rock solid and affordable. The Mongoora bike phone mount will make listening to music, shooting videos, and track your location convenient. 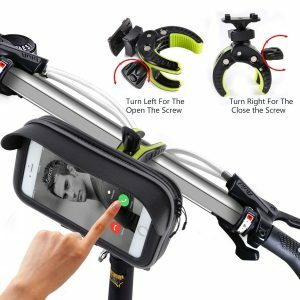 All you need is mounting it on the handlebars and inserting the phone inside the mount. The device is suitable for a range of phones including iPhone 7 /7Plus, 6 /6Plus, 5s, 5, Nexus, Samsung Galaxy S7 /S7 Edge, Nokia, Samsung S6, S5, S4, LG and more. It’s made from sturdy plastic for long life and good support and can be fitted on handlebars with a diameter of 0.9- 1.3 inches. The Fnova brand is becoming popular in the market. This particular unit is a crowd favorite and popular with normal as well as extreme cyclists and bikers. The silicone-made unit offers all-around protection and is more reliable than plastic types. It has good shock and impact absorbency easily flexes to support small and large phones and is also more durable and environmentally friendly. The universal mount can support phones with a screen size starting from 4 inches up to 6 inches. Unlike plastic, it doesn’t break, feel too rigid, shake, or emit annoying sounds. Additionally, users love it because it’s easy to mount and adjust, and also clean. However, it’s a bit basic and doesn’t rotate a lot. The PATEA phone mount is made from silicone and comes with a universal-style mounting. It can support different phones including Android and iOS. The unit also works with GoPro and GPS devices. The bracket wings can accommodate phone widths of between 1.88 and 4.17 inches (4.8 and 10.6 cm) and comes in a 360-degree rotatable nature. It can be mounted on handlebars whose diameter is between 0.88 and 1.4 inches/ 2.2 and 3.6 cm. The silicone strap provide a better support while the One-Button release makes removable simple and easy. The main pros are easy to install, easy to adjust, compatible with many phones, durable and good grip. 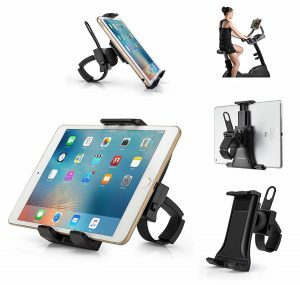 If you normally ride with your iPhone 7 Plus, 7, 6S plus, 6 S, 5s, 5c, Note 5, 4, 3, HTC, Go Pro, GPS devices or any other phone, then you should consider this bike mount. 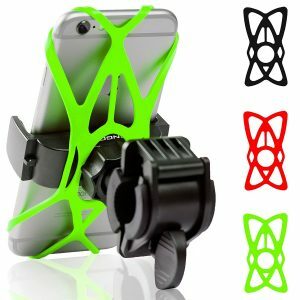 The plastic mount comes in a simple yet functional device to hold your phone and other devices while cycling. The three grippers provide a firm grip on the phone without affecting its functionality. It features a 360-degree rotatable nature for quick and simple access while the touchscreen improves the experience and safety. The universal cradle clamp can support phone widths from 3.5 to 5.8 inches. High quality, user-friendly design, easy installation and removal, and nice looks are some of its key advantages. The negative is the plastic mount may require re-tightening since it tends to become loose over time. 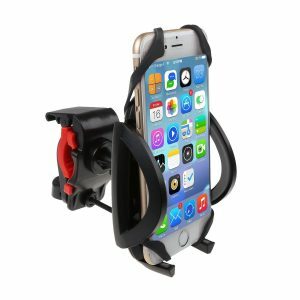 AboveTEK All-In-One Cycling Phone Mount Securing your phone on your bike’s handlebars is more convenient with this black phone mount by AboveTEK. Coming in an All-in-One design, this unit can expand from 4.5 to 8.5 inches. It can handle phone widths from 3.5 up to 12 inches and features a simple and practical design that offers instant setup and quick removal. The unit includes an adjustable 360-degree swivel stand for all-around view while the rubber-padded straps enhance protection and stability. The universal cradle allows it to also work with tablet PCs. Its main advantages are easy setup, quick removal, good support, and easy adjustment. If you don’t mind the black color, then this Visnfa mount should be a good addition to your biking accessories. It’s made from premium ABS engineering plastic and can accommodate phones with a width of 3.5 and 6.5 inches. The unit can rotate 360 degrees for easy viewing, use, and convenience while the 4-corner clamp system improves the sturdiness and safety. It’s universality compatible with Android, iPhone, and GPS devices and does not require any tools for installation. Its pros are the easy installation, firm support, tool-free installation and sturdy construction. 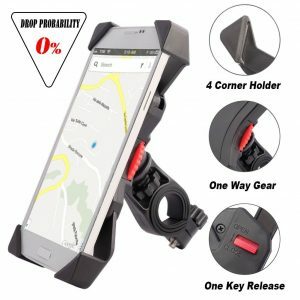 A phone mount is a must-have device for any serious or enthusiastic biker. It allows you to shoot videos, take photos, answer calls, listen to music and much more. The simple design easily clamps on most handlebars and can be adjusted to suit the best angle or position. Unfortunately, the mounts aren’t all the same. Some may be a bit small, others a bit large, while there are those that are too rigid or turn a lot. You also may end up with a poorly crafted device that can’t tolerate the road vibrations, breaks down easily after exposure to the elements, or wobbles too much, or doesn’t offer a firm support. 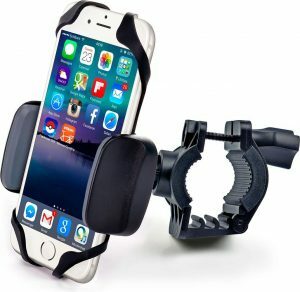 In this top 10 best bike phone mounts in 2019 review, we have listed the top products on the market. Simply pick one or two and take the cycling experience to a higher level.